Venue: Murray Regional Equestrian Centre, Murray Street, Coolup. Join us for 3 exciting days of drafting! 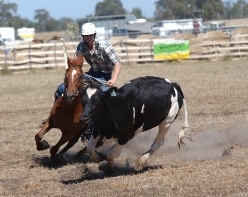 Saturday Afternoon - watch the cream of Campdrafting compete in the Quilty Open Memorial Campdraft followed by a sumptuous Dinner & Bar plus live entertainment to dance the night away!